Google's virtual reality suite Jump incorporates the GoPro Array and facilitates Expeditions. 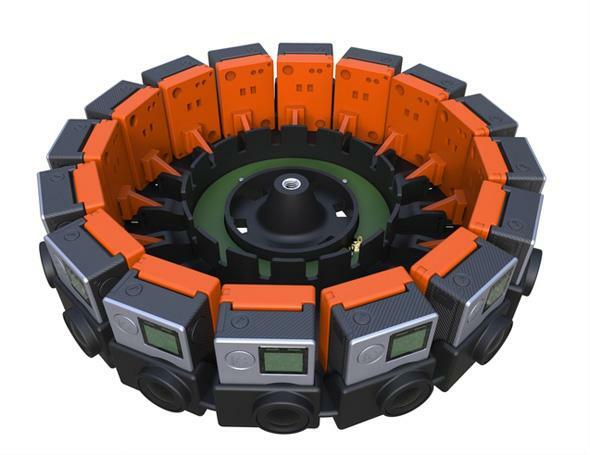 GoPro’s 360 degree camera array based on Google’s design. Virtual reality is one of those technologies that’s always supposed to be right around the corner, but it didn’t appear to be actually happening until Oculus and a few other companies started forging ahead a couple of years ago. Even then, VR didn’t really seem especially mainstream until Facebook acquired Oculus in 2014. Suddenly Samsung was debuting its Gear VR headset, and Microsoft was previewing HoloLens. But on Thursday Google made some VR announcements of its own, and they might be the biggest step forward yet. Jump is the company’s new suite of VR production products. It includes a new camera rig developed with GoPro, software by Google that stitches footage from multiple cameras into seamless 360 degree film, and a player to host and display the finished product. The third component was relatively easy to implement, because it’s just YouTube. When you hear it, it makes so much sense that the way to get VR to take off is to host the content on the most popular video site in the world. Google has also been developing new software and products for Jump, though. Google’s vice president of product management, Clay Bavor, explained that the company has created designs for a camera array that can be made out of different materials (like 3-D printer plastic, or machined metal) and arranges 16 cameras in a circle with the geometry specifically designed to optomize things like field of view and overlap. The plans will be available from Google for free, but the company also worked with GoPro, which will offer a version of the rig. For six months this device will be available to YouTube’s top creators—after which it will presumably get a consumer release. This is where the Google magic really begins. The Assembler takes 16 different video feeds and uses a combination of computational photography, computer vision, and a whole lot of computers to recreate the scene as viewed from thousands of in-between viewpoints everywhere along the circumference of the camera rig. And after all of this, you don’t need a powerful computer or an expensive headset to view virtual reality footage on YouTube. Google’s solution is Cardboard, the simple viewer it debuted last year (and updated Thursday) that turns any smartphone into a VR headset. The plans are also freely available, and lots of companies have been developing apps for Cardboard or selling Cardboard kits. By letting the smartphones we already own be the limiting factor for graphics and processing power, Google is ensuring that average consumers will actually be able to access VR right away.